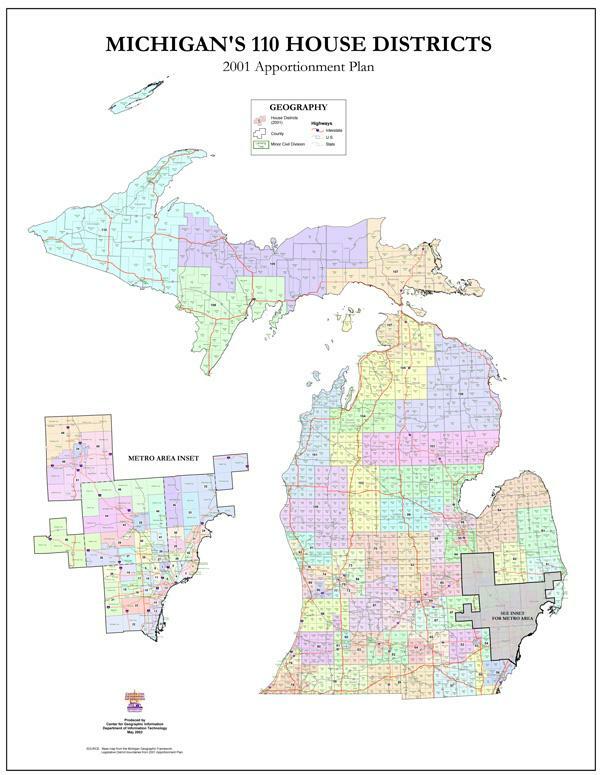 Michigan's 110 House Districts. Plans are underway to redraw the district lines after the results of the 2010 Census. States must redraw congressional and legislative maps to adjust for the shifts in population when the census numbers are released every ten years. This time Michigan lost population while other states gained. That means Michigan will lose a representative in Congress. But there were also shifts of population within the state which means the state house and senate districts will have to be redrawn. In Michigan, the state legislature is responsible for redrawing the maps that define voting districts for the legislature and Congress. It’s kind of complicated. There are federal requirements. There are state requirements. Eric Swanson is the Director of Michigan’s Center for Shared Solutions and Technology Partnerships. Among other things, that state office collects the population data from the federal Census Bureau. Swanson says the legislature does have to meet those federal and state requirements such as not splitting cities down the middle. LG: What do you mean by communities of interest? Swanson does not talk about the big elephant in the middle of the room. Politics. Every member of Congress and every member of the legislature who’s not at the end of term limits has something at stake. John Bebow is with the Center for Michigan. It’s a non-partisan think tank. Actually it calls itself a “think and do” tank. Bebow and his colleague Susan Demas looked at the effects of the last redistricting. Bebow says redrawing the maps in Michigan is one of the most political endeavors there is and it affects politics in the state for the entire next decade. “This is engineered for partisan advantage. Democrats did it in previous decades and Republicans clearly acknowledge that they’ve done it and they did it in 2000. We talked to one of the architects for the 2000 redistricting for our report and he said, “Yeah. That’s the way it is. If you don’t like it, get the majority. That’s the chair of the House Redistricting and Elections Committee, Representative Pete Lund. Representative Lund says people have moved. District boundaries have to move. His committee will work to make sure those people are properly represented in Congress and the legislature. But, John Bebow at the Center for Michigan says the past ten years indicate it’s much more than that. It’s about giving one party or the other political advantage. The process comes down to the politicians choosing their voters, instead of the voters choosing the representatives. Ten years ago, when Republicans controlled the process, the maps were drawn to give them political advantage and the numbers from the last decade of elections show it worked. “Republicans garnered 47% of the statewide votes in the House of Representatives for the past decade, but maintained almost 51% of the seats. In the Senate they had 49% of the statewide vote for Senate and 60% of the seats. So, there is a differential there. The Senate has been held by the Republicans for the entire decade. Democrats only gained control of the House during the last term of Governor Jennifer Granholm. Bebow says if the districts were more competitive, politicians would have to worry more about everyone in their district instead of just their party faithful. He says we’d see more politicians in the middle of the political spectrum rather than from the extremes of each party. Represenative Pete Lund says this time around –hey, the people have spoken. While there are public hearings on the redistricting process, it’s hard for the typical voter to offer much in the way of influence. Not a lot of us have the skills or tools to redraw the maps on our own. So, one group is offering some help. The Michigan Center for Election Law and Administration is holding a competition. Jocelyn Benson, who unsuccessfully ran for Secretary of State as a Democrat last year, is the founder and CEO of the organization. She says this Michigan Citizens’ Redistricting Competition is an attempt to get people involved in the process. Benson says she hopes citizens come up with better maps than the politicians. They have until May 23rd to turn in their maps for the legislature’s consideration. And Benson believes that could be the first step in removing redistricting from a partisan exercise to something that better represents the people. Those states and others have created independent redistricting commissions to draw the maps. The six states that rely on commissions to redraw the districts instead of the legislatures have had varying degrees of success. According to an analysis by the National Conference of State Legislatures, some of the commissions’ maps ended up being thrown out because they didn’t meet federal or state requirements. Some of the commissions are made up of partisan appointees, hardly removing politics from the process. But, in Iowa, where they’ve already redrawn their political districts, they do it differently. The legislature does vote on the plans, but non-partisan legislative staff develop the maps for the state House and Senate as well as the U.S. House districts without any political or election data. The National Conference of State Legislatures reports no other state does it quite like Iowa. And… it seems to work. CORRECTION: An earlier version incorrectly indicated Democrats controlled the House after the first election of Governor Granholm and again when President Barack Obama was elected. The above story has been corrected.